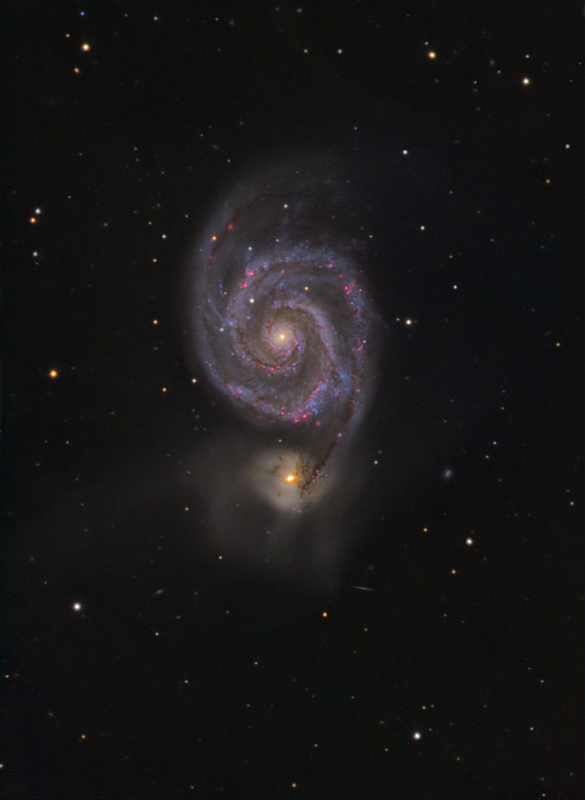 The perfectly named, 'Whirlpool' Galaxy. This excellent face-on spiral galaxy was discovered by Charles Messier in 1774. The spiral is actually closer to us than the smaller galaxy, NGC 5195 but they appear to have interacted in the past, when the smaller galaxy passed through M51 about 500 million years ago. 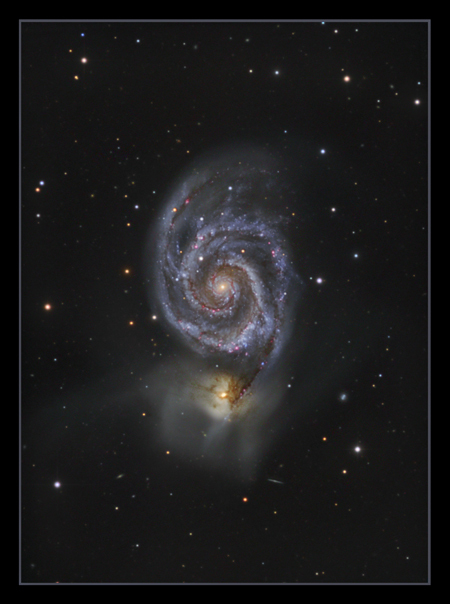 At that time, it came from behind M51 and then about 50-100 million years ago passed back through the disc to its position now, which is just behind the main galaxy.
. This was the galaxy that in 1845, Lord Rosse first saw spiral structure in galaxies, using his 72 inch 'Leviathan', then the largest telescope in the world. At the time, it wasn't known that these were separate galaxies, and the so called 'spiral nebulae' were thought to be part of the Milky Way. 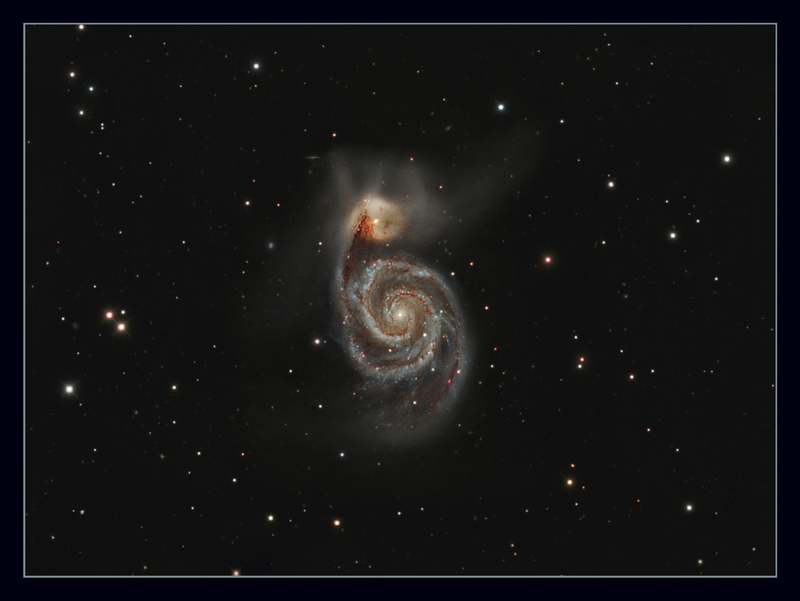 The top image is my latest attempt at M51. This is made up of data gathered over this spring (2012) and, for the halo, all of my 2009 and 2010 luminance data combined with the 2012 data. The 2012 subs were captured at Lucksall during SGL7,and from my observatory using an IKI/Astrophad 10 inch Ritchey Chretein, with luminance taken with a Starlight Xpresss H18 and an M25C OSC camera for colour. The earlier luminance and Ha data was captured from home with a TMB152 and Atik 16HR.I've resisted the temptation to push the Ha regions, and have tried to go for a 'natural' (to my eye) look to the image. I think I've reached the limit of what can be achieved on the halo from my site due to background skyglow....if I want to go deeper, then I need a darker site I suspect. Total imaging time. 59 hrs 12 minutes. This is my April 2010 image. TMB 152 @ F8, Atik 16HR. Total imaging time. 24 hrs 15 minutes. Ha from the previous year added to the red channel. Total. 9 hrs 47 minutes.